In 2004, Dove launched its Campaign for Real Beauty, an ad campaign that broke from traditional beauty advertising, which emphasizes impossibly thin, blemish-free bodies. Instead, their ads were populated by women of all shapes and colors. The campaign’s inclusive message garnered buckets of media adoration and industry awards for parent company Unilever. Dove’s viral hit “Evolution” tackled how rampant Photoshopping contributes to unrealistic standards for women in the beauty industry. The campaign peaked in 2013 with the “Sketches” YouTube spot, which highlighted the differences between how women perceive their own beauty, and how they are perceived by others. The spot racked up more than 50 million views by the end of the year. By leveraging a vaguely feminist critique of modern attitudes about beauty, Dove “started a conversation,” a holy grail achievement in the social media age. Thirteen years later, the campaign is still rolling and widely recognized as a gold standard for effective cause marketing. This month Dove released a line of body washes bottled in various shapes and sizes to reflect the diversity of women’s body types. Since the release of Dove’s campaign, countless brands have tried, and often failed, to appropriate social causes. Most big consumer brands want to follow in Dove’s footsteps. They want to “start a conversation.” They want to be associated with what’s fresh, young, hip, forward-thinking and progressive. They want to be woke. Lyft’s CEO recently called his company “woke” in contrast to its competitor Uber, which has come under fire for its perceived lack of corporate values. “Woke” derives from “stay woke,” a phrase which made its way to mass Twitter usage by way of Black Lives Matter activists. The phrase originates from a broader milieu of black activism and refers to maintaining a healthy paranoia about the hidden machinations of oppressive power structures. To “stay woke” was to be aware of systematic oppression and to participate in a collective movement to fight it. Since its adoption by mass culture, the term has lost much of its revolutionary bite. It’s often used simply to describe people or groups that display vaguely progressive ideals like inclusion, tolerance, social justice and equality. To be woke is to be in the in-crowd, to be on the right side of history. Although these values have historically been championed by social progressives, they are palatable enough to most modern consumers. Advertisers have spent the last decade or two flirting with progressive signifiers because the research told them that most millennials care about the ideals of progressivism. Study after study reassured advertisers that today’s young people care more than their parents about social responsibility and authenticity, the idea that the brand actually cares about their effect on the world and its inhabitants. Brands flirting with progressive causes used to bring risk of a conservative backlash, but brands have largely learned to live with this concern. Conservatives are mostly older, and their kids mostly don’t share their values. Brands’ virtue-signalling progressive messaging creates a positive feedback loop where media outlets, similarly market-driven by liberal millennials, cheer them on. In this environment, conservative backlash doesn’t possess enough reach to severely damage a campaign. Today the bigger risk of backlash comes from the Left: Millennials recognize a cash-in opportunity when they see it, and they are equipped with the social media reach to mock inauthentic marketing efforts to the ends of the earth. Like this one, from Secret, which depicts a woman psyching herself up to request a raise. The spot aimed to draw attention to gender inequality, but indirectly put the blame on nervous women for their comparatively low salaries rather than addressing the deeply rooted systemic inequalities that result in women earning less than their male counterparts. But this isn’t entirely a recent phenomenon. Advertisers have long played to audiences’ sense of ethics. 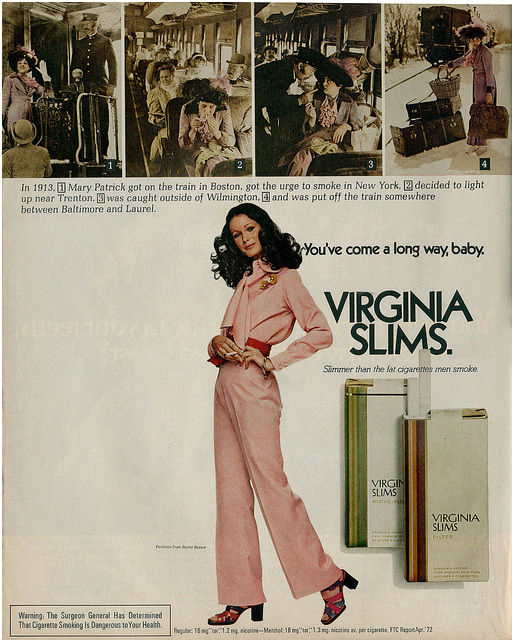 Coke glommed onto late-60s kumbaya vibes with “I’d Like to Buy the World a Coke.” Virginia Slims rode the women’s lib movement to the top of the market with “You’ve Come a Long Way, Baby.” The United Colors of Benetton repurposed a photograph of a man dying of AIDS for an ad. These campaigns worked then, but today the average consumer is smarter, more suspicious of manipulative advertising, and more highly networked. And in the current political climate, the stakes are higher than ever. Political ads that might’ve passed the smell test this time last year are going to be scrutinized more intensely than ever. In March, 2015, Starbucks tried to “start a conversation” with its Race Together campaign. It did, but not the one they’d anticipated. Audi tried to draw attention to income inequality between men and women in February, 2017, but ignored that men outnumber women five to one on Audi’s own leadership team. In April, Pepsi depicted a nebulous street protest with marchers advocating for nothing in particular, unless one counts “peace” and “global unity”—goals with which few can find fault. “Joining the conversation” is even written on a protester’s sign. The spot culminates with Kendall Jenner defusing the intensity of the protest by handing a stone-faced police officer a Pepsi, which transforms the protest into a dance party, where cops and protesters boogie in global harmony. The power of refreshment saves the day. The problem with Pepsi’s approach to authenticity is emblematic of a failure to comprehend what authenticity actually means. Authenticity is Patagonia spending decades funding wildlife and environment conservation. It’s MAC Cosmetics boldly supporting LGBT causes at least a decade before the rest of the corporate world became comfortable with the idea. Authentic personal or brand identity needs to be undergirded with work. In corporate responsibility terms, that typically means cash. Brands can buy authenticity, but it doesn’t happen overnight, and funding programs must also be coupled with respect and understanding for the social movements with which they seek to align themselves. If Pepsi’s brand managers had educated themselves on the painful history and ongoing struggle of the protest movements they sought to evoke, they would have known that the social problems the movements are fighting are far too contentious and intractable to ever be resolved by an act so absurdly trite as a celebrity sharing a Pepsi with a random police officer. Pepsi, a multinational food and beverage company, is seen here co-opting the imagery and language of a movement that is inherently antagonistic toward capitalism itself. The closer Pepsi gets to reflecting the actual goals of Black Lives Matter and similar groups, the greater the risk of alienating roughly half of their customer base. But the more hedging and vague their approach, the more likely they are to slight the activists and true believers, no matter how noble the intention. Pepsi aimed for something closer to the latter than the former, thus the wishy-washy half-heartedness of the spot. When they see an ad like this, Millennials ask themselves, “Does Pepsi really care about this stuff?” Pepsi has given $900M to various charitable causes over the years, some of which ostensibly aim to fight poverty and even inequality. But how many of them can you name? Do these efforts reflect Pepsi’s brand identity? Why didn’t Pepsi make an ad about them instead? The conscious capitalist approach is not a marketing-centric approach. It starts with doing the right thing, not with using social media. It’s possible for a brand to do it right, even if they don’t have decades behind them having done it. But they can’t take all kinds of credit for the first step forward. The credit needs to be relative to the contribution. You have to participate. Are the senior people active in the cause? Are they giving their expertise? Are they donating thousands of hours of the company’s time to help with that cause? It’s not just writing a check. Today’s modern consumer has the ability to act on a lot more information than the consumer of yesterday, and they’re going to be able to distinguish between true conscious capitalists and phonies. Many brands have been supporting charitable causes for decades, but aren’t sure how to talk about that without seeming self-congratulatory. As a result, these contributions get tucked into an annual report that everyday consumers will never see. A better path might be that brands talk openly about their efforts through the lens of the larger problem they’re trying to help solve, while acknowledging that these are complex issues without an easy fix. Most likely they’re playing a small role in an unfolding story. Brands can use their resources to help others understand the issue, and highlight those who are making progress possible. Consumers welcome brands who support causes they care about, but those brands have to be careful not to claim that they are the hero or solution to the problem on which they’re shedding light. The backlash to Pepsi’s recent campaign marks a sea change which will likely scare brands away from “woke” posturing. Pepsi wasn’t the first casualty of the “woke” branding era, but it could be one of the last at that scale. One can imagine the brand managers who, after seeing the Pepsi backlash, called an all-hands meeting to decide if they wanted to scrap whatever idea they were working on. Brands who want to align themselves with social causes will need to put in the work and do the homework. They’ll invest real dollars into supporting those causes, and bring people on board who can speak the language of those causes because they’ve lived them.